Intaglio print with chine collé. Altogether, eight 4x3 inch plates were used to create this print. Three plates contain etched images: of elm seeds rendered from life, of particle physics tracks, and fragments of musical notation. Chine collé was used to apply a 4x3-inch reproduction of a map of fires in the rainforests on Java, in Indonesia during the summer of 2013. Smoke from the fires, thought to be lit primarily to clear land for palm oil plantations, created hazardous air pollution conditions over Singapore and southern Malaysia. 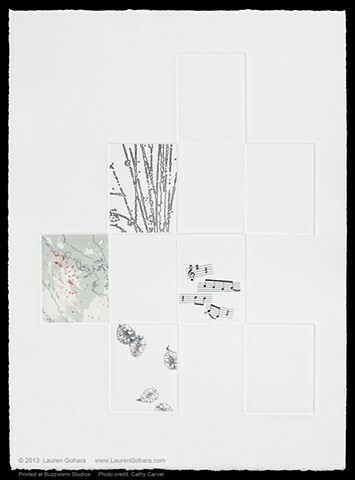 The impressions of four blank plates reinforce the debossed grid.